Toronto's most vulnerable populations, and the quality of our public discourse, are not much better off today than they were under Rob Ford. 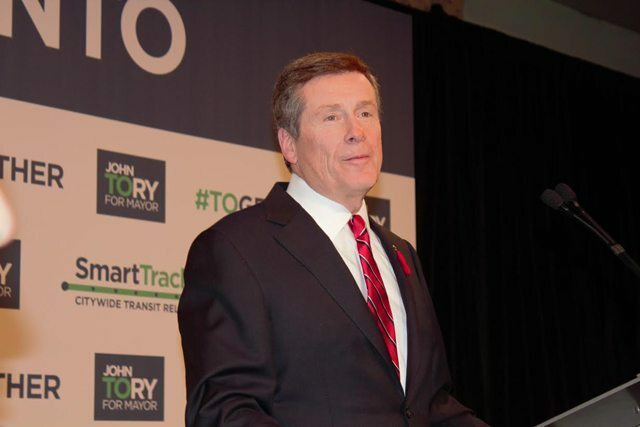 In John Tory’s victory speech Monday night, he said, “Tonight we start the work of building one Toronto.” He has spoken relentlessly during this campaign about the need for goodwill and unity. Unfortunately, last night’s election demonstrated a Toronto that is more divided than ever. Look at the election map. Unsurprisingly—and as was the case in 2010—the mayoral vote was divided along income lines [PDF]. Wards with lower average incomes primarily voted for Doug Ford; wards with higher average incomes primarily voted for John Tory or Olivia Chow. Now look at the election results again: specifically, at election turnout. It was white-hot in wards won by Tory or Chow; it was moderate or even anemic in Ford wards. The story of last night was increased turnout overall—up to 64 per cent from just over 50 per cent in 2010—but there is a large chunk of this city that simply doesn’t engage with politics at all, or engages with it only to reject it. The reason the Fords can connect with certain parts of Toronto so well is because many Etobicoke and Scarborough residents have become convinced that municipal politicians do literally nothing for them. This isn’t a great secret: Rob Ford’s retail politics have transcended their own reality at this point to become a self-sustaining myth—so great that Mikey Ford, a 20-year-old with no professional track record of any kind, whose sole reason for being in politics is his last name, won his school board trustee race by 21 per cent. Mikey Ford has, bluntly, not done a thing for any voter in his life, but he’s a Ford and there’s that Ford brand: they’re the guys who will help the little guy. Except, of course, that the Ford myth is fiction. The Fords have consistently voted against programs and investments that would help the poorest neighbourhoods in Toronto. Tory ran as a calmer, gentler Ford, promising unspecified “efficiencies” and promising to hold the line on taxes. And that is the pitch voters bought: all the frugality, with 100 per cent less drama. Slight problem: the only way to maintain, never mind improve, services and support for Torontonians is to spend money—more, and possibly a lot more. The lie at the heart of Toronto’s politics in both 2010 and 2014 is that Rob Ford and John Tory knew this, and they both ran on it, while professing to believe the opposite. The Scarborough subway that both the Fords and Tory backed will cost at least a billion dollars more to build than the originally planned LRT would. Tory’s splashy but deeply flawed SmartTrack plan is based on a financing scheme that may leave voters on the hook for hundreds of millions more. They have actively run on platforms that involve spending a lot more money, while simultaneously claiming the mantle of fiscal restraint. This is the incoherence that now frames our civic discourse. In the last two elections, voters picked a platform that cost more and that was sold on the promise that we’d spend less. We can all argue about whether the Scarborough subway or SmartTrack is the best use of money, or whether those dollars would be better spent on affordable housing or childcare or more trees, but there is an unspoken consensus across the board on this point: To give Torontonians more and better services, we will need to spend more money. The difference between the major candidates in the last two elections has been how honest each was willing to be about this, and how they wanted to spend the money. But nobody ever actually ran on a platform that would see us spending less. John Tory ran on this inconsistent set of claims much as Ford did. He said in his victory speech that he would find “efficiencies,” and also that he wanted Toronto to be a city that didn’t leave people behind. At no point during the campaign did he say much specifically about how he would accomplish either, and he never acknowledged the virtual impossibility of trying to do both at once. But now that he’s won, he needs to come to grips with reality, and he needs to bring Torontonians along with him. If he does not, the entire city will suffer—our most disenfranchised residents most of all. The incoherence that we’ve been living with must be exposed for the dangerous, disingenuous lie that it is. We need to be re-acquainted with some basic truths about our city, like the fact that Toronto is under-taxed relative to its neighbours, that you can’t have nice new things without paying for them, and that we hire experts to tell us what transit to build because those decisions should be driven by evidence and not cynical vote-buying. If Toronto is to emerge from Ford-era politics not just in name but in substance, Tory must make good on his promise to build “one Toronto,” trying to bridge the differences between different parts of the city rather than use them as wedge issues to widen those gaps and increase everyone’s cynicism along the way. To do that he must work with councillors from all parts of the city and the political spectrum—unlike Ford, who famously excluded downtown councillors from the executive committee and other key positions. He must capitalize on the massive increase in voter turnout, and make it easier for Torontonians to stay involved in civic life between elections. He must get over his absurd claim that white privilege doesn’t exist in Toronto and actively reach out to racialized communities. And he must be honest about the massive problem he is inheriting: a budget shortfall that has resulted from four years of inadequate property tax increases. The tragedy, however, is that it would be hard to find a candidate less equipped to handle these challenges and these needs than John Tory, whose entire campaign was an extended fantasy: the same fantasy all conservative candidates, including the Fords, have peddled for years. He will have the assistance of what looks to be one of the least impressive city councils Toronto has ever assembled. The power of incumbency in council races has become truly breathtaking: 37 of 38 councillors running for re-election won their seats. Ron Moeser, who missed much of his previous term due to illness, won Ward 44 nonetheless. Jaye Robinson won with over 80 per cent of the vote in Ward 25. Ana Bailao, who pled guilty to driving drunk, still managed to beat Alex Mazer quite solidly. Non-entity councillors like Vincent Crisanti, Mark Grimes, and David Shiner racked up enormous wins. Giorgio Mammoliti won by approximately 11 per cent while being the subject of an ethics investigation. There is simply no external motivation in Toronto for city councillors to be better, to govern more bravely and more honestly, because just about anyone can win as an incumbent in Toronto. Where disappointing incumbents did not return, new conservative voices arose. Stephen (son of Doug) Holyday in Ward 3, John Campbell in Ward 4, Justin Di Ciano in Ward 5, Cristin Carmichael-Greb in Ward 16, Jon Burnside in Ward 26—they all ran on Tory’s platform of no-tax-increases-greater-than-rate-of-inflation. (Tory endorsed several of them.) This council will be, based on the platforms of these new councillors, more conservative than the last. Many will want to scrap the Sheppard and Finch LRTs; what happens to those approved and paid-for transit lines will be a major test of Tory’s mayoralty. Of course, we could be wrong. Many Tory voters voted for him in part because he is perceived as amiable, reasonable, and willing to listen to all sides of the political spectrum. He may rise to the occasion, form an administration that makes room for intelligent opposition, and keep faith with his promise to make sure Torontonians do not get left behind, even if that winds up costing some money. His lack of drama may create space for substance, for substantive debate, and for informed decision-making. We hope that it does.